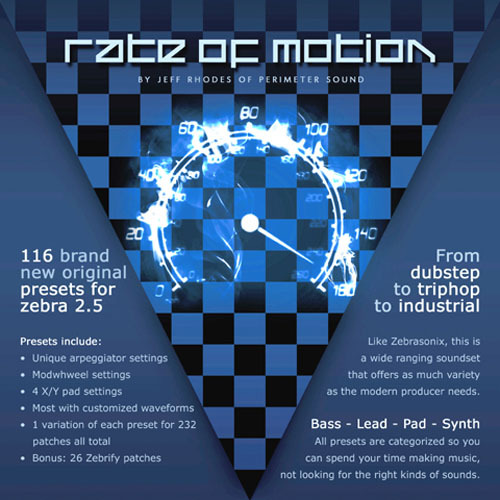 'Rate Of Motion' is a preset collection for U-He Zebra 2.5 soft synthesizer created by Jeff Rhodes of Perimeter Sound. Picking up where 'Zebrasonix' left off: with more melodic and rhythmically interesting arpeggiator programming, weird wonderful and useful modwheel settings, and all 4 X/Y pads mapped and ready to tweak to fit your tracks. • 26 Zebrify effect patches are included as a bonus From dubstep to triphop to industrial, this is a wide ranging soundset that offers as much variety as the modern producer needs.